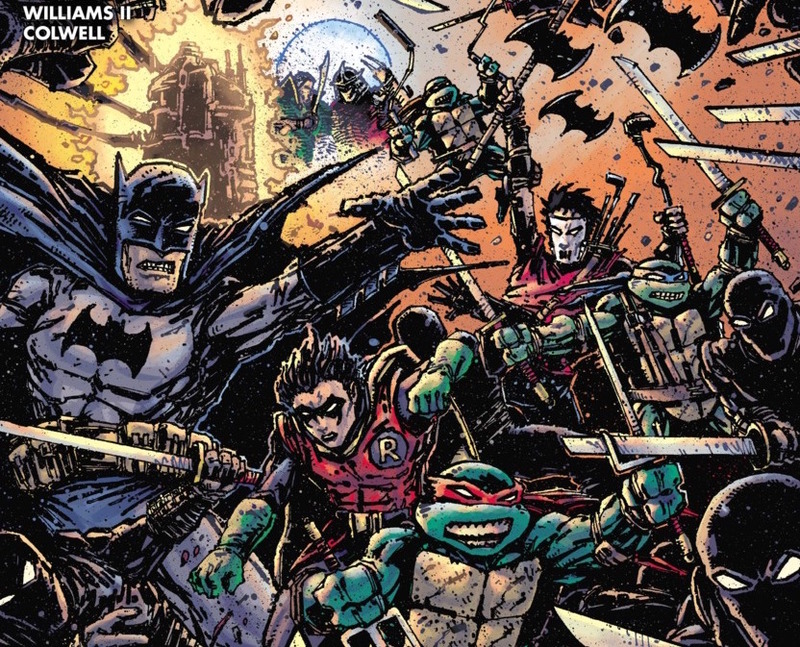 Batman/Teenage Mutant Ninja Turtles #6 Review – AiPT! The final issue of the most epically radical crossover of 2016 is here! If you read the last issue you know you’re buying this (that cliffhanger OMG! ), but those of you waiting for the reviews to come in — I know you want the answer to the question: Is it good? Someone frame this for me. I’ll wait. And he blows it out of the park again! Williams II makes all of these animal Batman rogues look fantastic. The types of animals chosen for each makes sense, but they also look flipping cool. I never thought I’d say, “The elephant Bane mask looks great” but there I said it. Just seeing the villains as animals is an awesome concept in itself, but Williams II makes them look natural and frightening to boot. Seriously, if DC wants to make Mr. Freeze a polar bear from now on I’m cool with that. Williams II also delivers on a Shredder vs. Batman battle; the full page spread relaying the action is wicked, with every kick and punch taking place over 20 panels across the page with Batman and Shredder sparring at the center of the page over all of them. Oh yeah, three words: awesome ninja robot suit. I’ll leave it at that, but if they make an action figure know it’ll be a hot seller. It looks a tad clunky, but so cool in this book. That might be the coolest Poison Ivy has looked in ages. Tynion IV wraps things up once again giving us cool panels we could have only dreamed of before. Seeing the Ninja Turtles take on these Mutagen infused animal Batman villains is fantastically fun with plenty of great dialogue from Michelangelo too. Can someone get Tynion on a Michelangelo solo book please? Dialogue is spot on throughout actually with Batman and Damian strategizing it up in the opening and the Turtles bringing their charm too. Leonardo is back, but not feeling so hot. I don’t know why I expected more, but the happy ending is definitely too easy. After multiple issues telling us the Ninja Turtles had to leave Gotham at a specific time or they’ll die, only to have that threat refuted that with some lucky science does cheapen the tension from previous issues. Something else that didn’t feel earned was Batman’s emotional goodbye. Sure he hung out and sparred with the Turtles, but would he really be so sad to see them go?